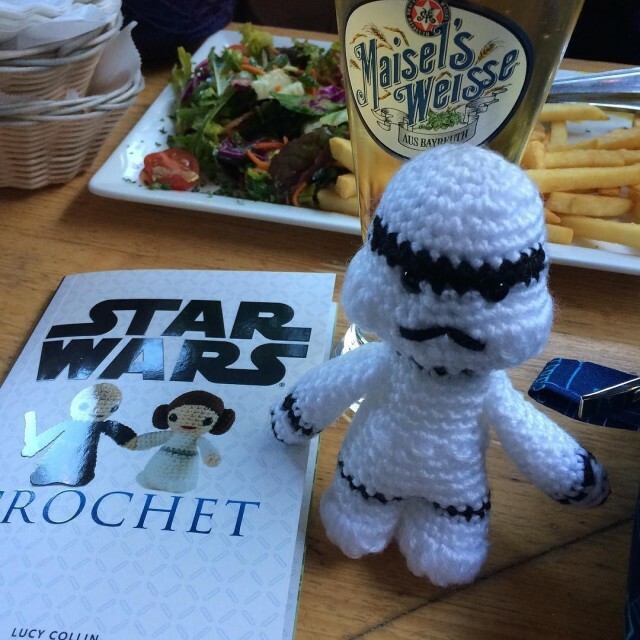 Storm Trooper at his knit nite debut. This little guy was super easy to do. Next up Yoda! The kit I got contains instructions for a bunch of characters and all the things you need to make a storm trooper and Yoda. I got mine at Michael’s but you can order it from Amazon. I like how the feet were designed: bobble stiches (new to me) at the bottom for stability and a little dimension. The “belt” is also a series of bobble stiches. The book has very clear instructions and photos that were essential for a newbie crocheter like me. I want to do the rest of the characters and am on the lookout for some solid wool (you’d think I’d have some in my stash, but I don’t). Any suggestions on what kind and where to grab some? Over on CraftyPod, Diane had a fantastic idea: Link Love Fridays. In August she is hosting a theme for each week, this week is for favorite tutorials. There’s so much potential for customizing a monogram like this. And it will give me more ideas for using up my washi tape stash. I have a ton of t-shirts I don’t wear but can’t part with because of the sentimental value. Making them into art is a brilliant way to use them. I’m thinking about seasonal decor – football season in particular. 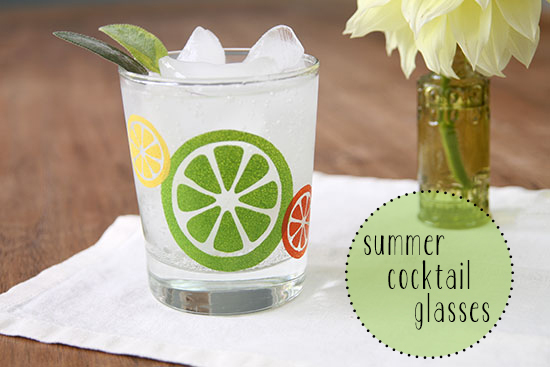 Charming set is made with stencils and glass paint. The technique could be used with so many different themes. I look at these and think “Kitty toys!” Plus they’re pretty with the embroidery floss stripes. 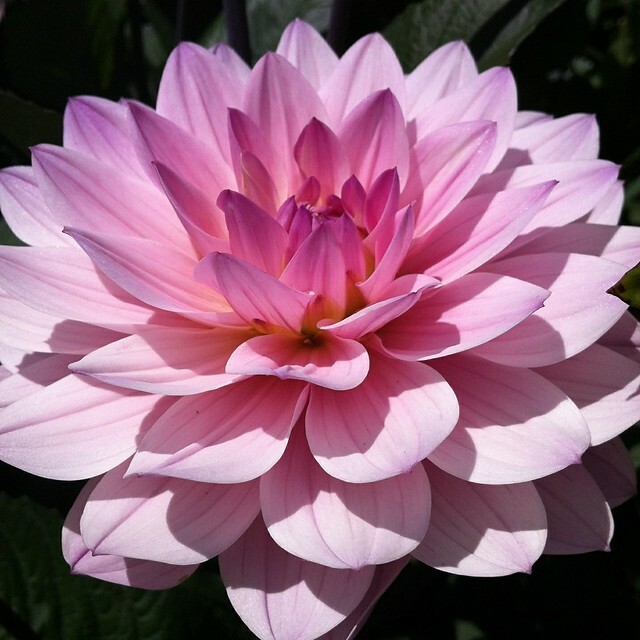 As always the Purl Bee’s photo tutorials are gorgeous and easy to follow. Leyla Torres’ video tutorial takes you step by step to create beautiful butterflies. Her blogpost has some wonderful advice on being a beginner and perseverance. 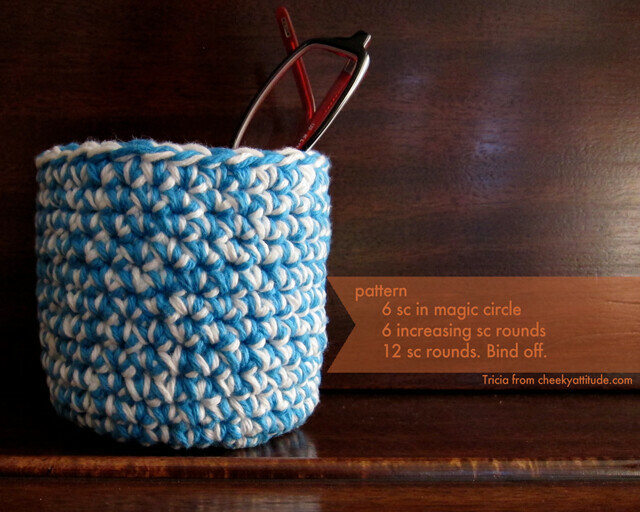 Head over to Crafty Pod and look at a bunch of other great crafty tutorials. 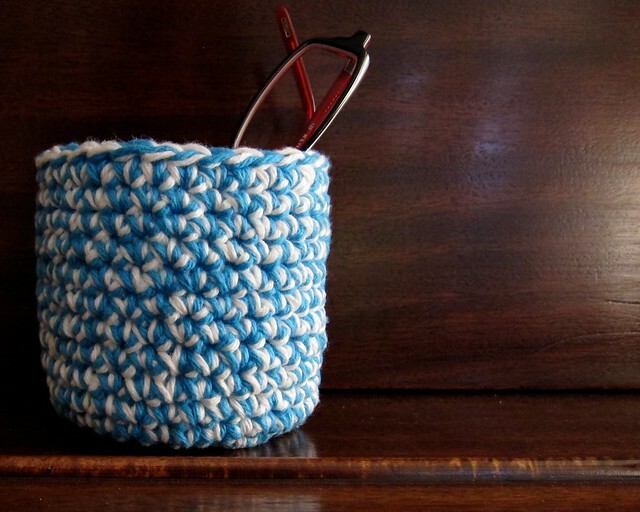 Crochet – If I can do it, you can too. It is possible that this little project has hooked this knitter on crochet. I was trying to figure out making rounds using the “magic circle” for simple coasters and forgot to increase. Slugs on the refrigerator has the tutorial post I was working from. I held two strands of kitchen cotton together and used an “E” hook. The bright blue and white of the kitchen cotton was so cheery, I just kept going. I will probably use it for pencils and pens, if I can keep the cats from playing with it. Author TriciaPosted on June 27, 2013 June 27, 2013 Categories Crafts, ProjectsTags crochet, Free Patterns, pattern1 Comment on Crochet – If I can do it, you can too.